It is true that mobility vehicles designed for wheelchair access exist, and transportation is possible for people in wheelchairs – but it is certainly not easy. The process of climbing out of a manual wheelchair and into a modified vehicle (and then collapsing the chair) takes considerable time and puts substantial strain on a person’s shoulders. Kenguru has been built from the ground up for people in wheelchairs. It is a small nimble electric vehicle – one designed specifically for quick, easy access by, and driving from, a wheelchair. 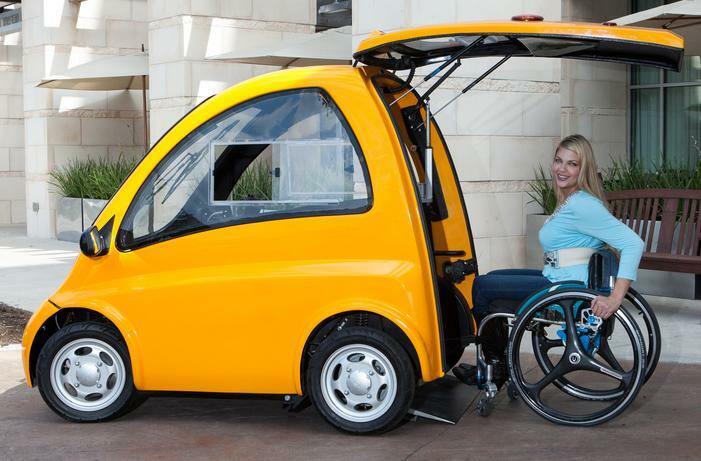 Its makers claim it is the world’s first drive-from-wheelchair electric car. Initially developed in Hungary, the Kenguru is now hand built in Texas in the US. The car’s design is at least six years old. Stacy Zoern, an attorney in Austin, has never walked due to a neuromuscular condition, has always used a wheelchair and was doing some online research on transportation about six years ago. That’s when she stumbled across Kenguru, a Budapest-based company advertising small electric vehicles that allowed wheelchair users to enter through a back hatch and drive – all while never getting out of the chair. The entire rear of the vehicle is a hatch that can be raised, allowing a wheelchair passenger to roll in using a built-in ramp. Stacy then setup Community Cars which now manufacturers Kengurus in Pflugerville. The Kenguru has only a single door to the rear of the vehicle for direct wheelchair access. It’s opened by remote control. Inside the driver is nestled in a 350-kg (772-lb) fiberglass cocoon 2125 mm (83.6 in) long, 1620 mm (63.8 in) wide and 1525 m (60 in) tall. That’s extremely compact. Empty weight with the batteries increases to 550 kg (1200 lb). The batteries power two 2-kW motors located on the rear axle. Kenguru offers a maximum speed of 45 km/h (28 mph), a range of between 70 and 110 km (43 and 68 miles) and a climbing ability limited to 20-percent gradients – perfect for short inner-city trips. 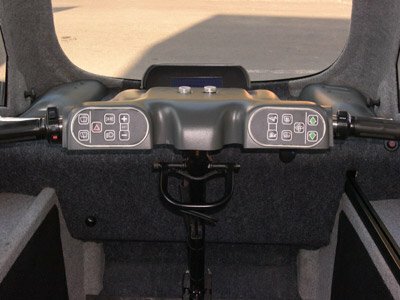 Motorcycle-style handlebars provide steering, though a joystick-controlled version is currently in development. Can you modify it to drive and break with one hand? Is there space for a service dog?